R LEO (R Leonis). Among the most dramatic and fascinating stars of the sky are the "long-period variables," the "LPVs," epitomized by the first one found, Mira (Omicron Ceti, in 1596), so much so that these ultra-variables are also called "Miras." To the eye, they typically vary by several magnitudes (Mira usually from third to 10th, though it has reached nearly to first) with periods of the order of a year (50 to several hundred days). A handful of others are visible to the naked eye when they are near maximum light, including Chi Cygni (which can hit close to third magnitude) and our star here, R Leonis (capital Roman letters from R to Z then double letters used to identify variables), which resides in western Leo west of Regulus. Very cool, Mira variables are also among the reddest of stars, the general class beaten out only by the deep red carbon stars, some of which (like Hind's Crimson Star, R Leporis) are also Miras. 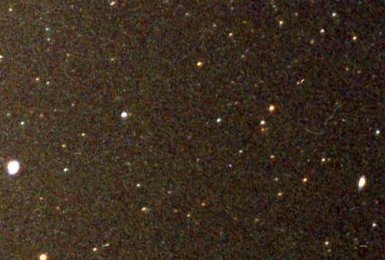 Deep red R Leonis, one of the first long-period variables known, lies in Leo to the right of center just beneath a somewhat brighter white star. Regulus (Alpha Leonis) appears at far left, Subra (Omicron Leo) at lower right. At minimum light the star would be gone, beneath the limit of the image presented here. R Leo, discovered in 1782, was the fourth such variable known, the earlier ones Mira itself (1596), Chi Cyg (1686), and R Hydrae (1704). R Leo typically varies between magnitudes 5 and 10.5 and back over a period of 312 days, though the maxima and minima vary by a magnitude or so over the years as well. LPVs, of which thousands are known, are among the biggest of all stars, exceeded only by high mass supergiants. R Leo is a deep class M (M8) giant, whose class also varies, between M7 and M9, giving it a lovely color described by Burnham as "rosy scarlet with often a seeming touch of purple." Three thousand days in the variation of R Leonis are plotted as visual magnitudes versus the running count of Julian Day number, which begins January 1, 4713 BCE. JD 2452500 is August 13, 2002, 2454750 October 10, 2008. 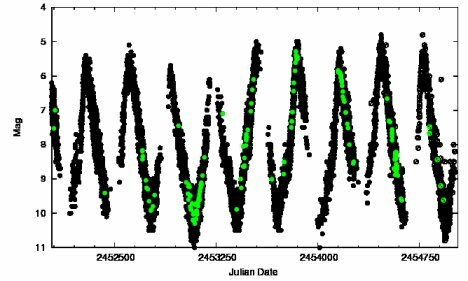 Not only does the star vary over its 312-day period, but the maxima and minima vary from one cycle to the next and over longer periods of time as well. Courtesy of the American Association of Variable Star Observers (AAVSO). These stars are so large that they do not have well-defined surfaces, making temperatures, sizes, masses, even distances through parallax uncertain. The best modern measure places R Leo 240 light years away, making it one of the closer Miras. Taking it as magnitude 5 at maximum light, adopting a temperature of 3000 Kelvin to account for a huge amount of infrared radiation, gives a luminosity 4000 times that of the Sun, a radius of 1.1 Astronomical Units (that is, it's as big as the orbit of the Earth), and a nominal birth mass of 1.5 solar. But don't take any of that too seriously. Direct measure of radius (by interferometry and lunar occultation) depends strongly on color and where we are in the pulsational cycle, the star's radius measured directly from as small as 1 AU (agreeing with that from luminosity and temperature) to as large as two AU, bigger than the orbit of Mars. Direct examination also shows the star to be asymmetric with a distinctive "point source" in its southern hemisphere. Long period variables are all well advanced in their evolution, and are expanding as giants for the second time, with dead carbon and oxygen cores. At some point they become quite unstable, and pulsate, expanding and contracting, which causes them to vary. The strong visual variation is a result more of temperature fluctuations produced by the pulsation. In total luminosity (and in the infrared), the variation is nowhere near as great. Miras lose mass at fierce rates, and at their maximum luminosities (which depend on mass), they lose their entire hydrogen envelopes and die as hot white dwarfs. During the transition, the hot cores light up the fleeing mass to create "planetary nebulae." And R Leo is indeed losing mass, the surrounding matter radiating powerful silicon monoxide (SiO) and hydroxyl (OH) masers, in which the molecules beam out laser-like microwave radio waves. Water is observed as well. Fluctuations in the quality of the SiO maser implies a magnetic field and the possibility of a planet, one you most certainly would not to live on. Written by Jim Kaler 7/31/09. Return to STARS.